(Berlin ׀ Brussels, 25.09.2018) Language is key to knowledge and social participation. 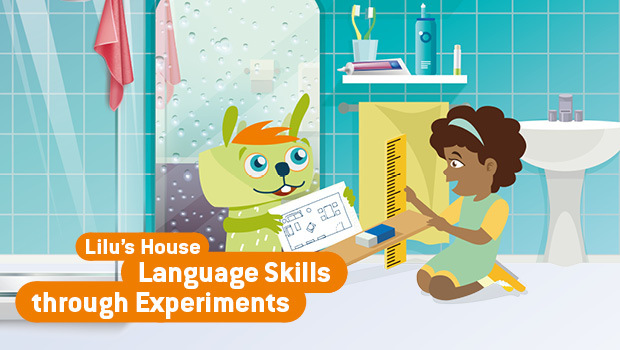 The new teaching brochure ‘Lilu’s House’ shows how to promote language skills through natural science experiments in primary school. The publication was presented last Friday by the non-profit association Science on Stage Germany at the Representation of the State of Hessen to the European Union in Brussels. The project was supported by the Joachim Herz Stiftung.Why do I see my reflection upside-down in a spoon? Why does bread dough not rise without yeast? For children, everyday life is full of questions. Inspired by this, an international teacher team from seven countries developed specific ideas and practical advice on how to promote the basic scientific knowledge of primary school children while simultaneously training their skills in reading, writing and speaking. It does not matter where children are from: they all love to explore and do inquiry-based experiments. Finding words together to articulate questions and to share learning results is a very effective way for children to develop their language skills,“ explains project coordindator Karoline Kirschner. The experiments are embedded in a story about the fantasy creature Lilu and the girl Alina, who go on a scientific discovery tour in bathroom, living room and kitchen. For every phenomenon that occurs to them, they need to solve tasks and to reflect on these verbally. Diverse difficulty levels of texts and tasks consider mixed-ability classes in learning and skills, and help to create inclusive lessons. This project was of special concern to us as the promotion of language skills is a key factor for inclusion – a topic which will occupy us for many years to come. We want to make a contribution to this in all classrooms around Europe,“ says Stefanie Schlunk, executive manager of Science on Stage Germany.